Every child is unique, so there’s no standard age in which a child should visit an orthodontist for the first time. Many times your child’s dentist will recommend a visit to the orthodontist but if you have concerns or would like to find out more about your child’s potential need for orthodontia, you can follow the American Association of Orthodontists recommendation that between ages 7 and 12 is a good time to begin seeing an orthodontist. By age seven, most children have lost some baby teeth and have started to get adult teeth. This is a great time for an orthodontist to identify and begin correcting jaw, bite, and alignment issues. In many cases, the earlier treatment begins, the less likely your child will need surgery in the future. Beginning treatment during childhood allows your orthodontist to gently guide the growth of your child’s jaw, regulate the width of the upper and lower arches, and to make it more likely that permanent teeth will develop in perfect alignment. Over-crowding can be reduced using simple and pain-free methods when a child begins orthodontic treatment early, and they are less likely to need to have permanent teeth removed later in life. AND YES, we often use Invisalign when appropriate for Early Treatment, and actually teach this approach to orthodontists worldwide. See our Invisalign First for Little Smiles page for more information on those treatment options. For very young children, a visit to the orthodontist at this stage can help improve minor speech problems and correct thumb sucking behavior. If you have concerns or questions about starting your child in orthodontics, please contact our office to schedule an initial consultation. Early treatment now will give your child a healthy, beautiful smile for the future. 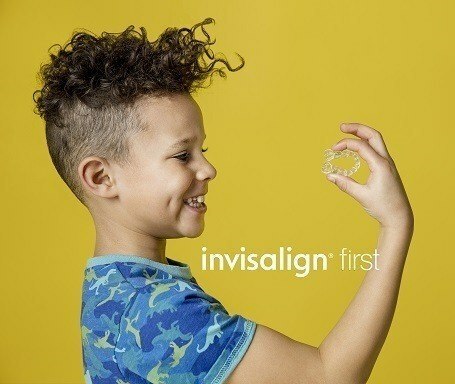 Invisalign First clear aligners are specifically designed for growing patients requiring Phase 1 treatment. It is an orthodontic solution that allows for the use of Invisalign technology in children whose teeth are still growing in without the use of metal expanders and brackets.